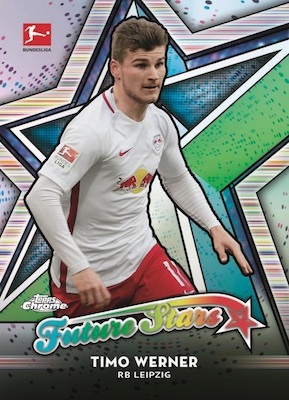 Featuring the best of German club fußball, 2018-19 Topps Chrome Bundesliga Soccer provides some of the top DFL stars in chromium. The Hobby-only boxes follow a format very familiar to Chrome collectors and each box includes one autograph. 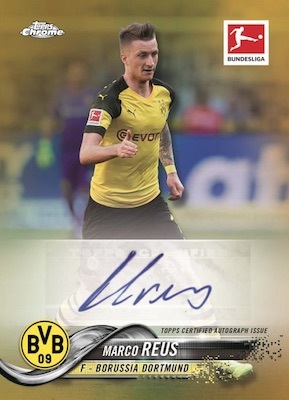 Although Topps has made multiple Bundesliga sets over the years, the 2019 product marks the first traditional release to get full distribution in the United States. The 90-card base set offers up key players across the league using the flagship MLB design. In addition, 2018-19 Topps Chrome Bundesliga has six base Refractor (1:3 packs) parallels in each box. Collectors can also build their Chrome Refractor rainbow with Purple (#/250), Blue (#/150), Green (#/99), Blue Wave (#/75), Gold (#/50), Orange (#/25), Red (#/10), Red Wave (#/10), and SuperFractor (1/1) options. 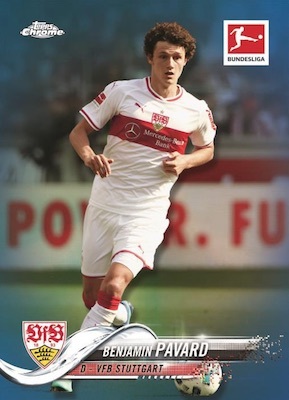 Changing out the photos for five Bundesliga stars, the Base Image Variations set adds one-of-one SuperFractors. Joining the base design, fans should recognize a few of the 2018-19 Topps Chrome Bundesliga inserts, as well. Future Stars works with the younger talent, while Superstar Sensations highlights the best player from each team and Top XI is for those that have a knack for finding the back of the net. Each insert offers a small assortment of Refractor parallels via Gold (#/50), Orange (#/25), Red (#/10), and SuperFractor (1/1) versions. 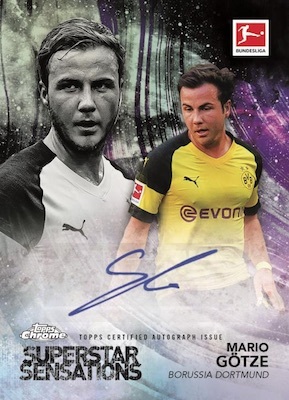 Dotting the 2018-19 Topps Chrome Bundesliga Soccer checklist with key subjects, the Base Chrome Autographs set houses most of the signatures. The lineup is infused with Refractor color thanks to the Blue (#/150), Green (#/99), Blue Wave (#/75), Gold (#/50), Orange (#/25), Red (#/10), Red Wave (#/10), and SuperFractor (1/1) parallels. Signed inserts include numbered Future Stars Autographs, Superstar Sensations Autographs and Top XI Autographs. Each card also has a one-of-one SuperFractor (1/1) parallel. REFRACTOR PARALLELS: Refractor (1:3 packs), Purple #/250, Blue #/150, Green #/99, Blue Wave #/75, Gold #/50, Orange #/25, Red #/10, Red Wave #/10, SuperFractor 1/1. View the 2018-19 Topps Chrome Bundesliga checklist Excel spreadsheet.